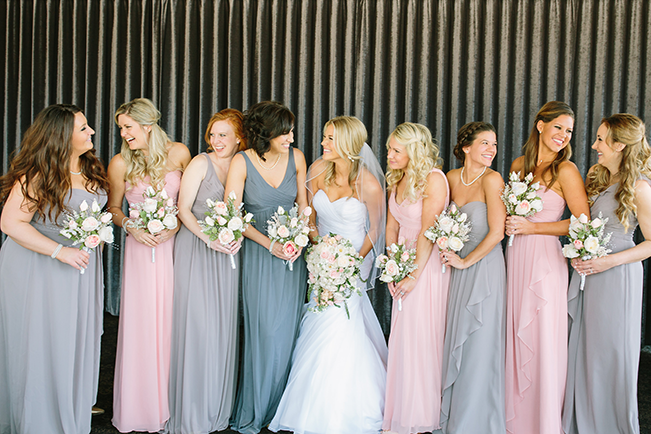 How to choose the perfect bridesmaids dresses for your wedding. Every lady you have asked to be in your bridal party is important to you and special - they are the ladies you want to share all the experiences, adventures, and memories from your wedding with through out the planning process and on the big day. They will become your Bridal Tribe and that is a rare and special bond. We have been so fortunate to be part of that process for hundreds of tribes and we wanted to share some of the most important things we have learned along the way to help you find the perfect dresses! Choosing bridesmaid dresses for your wedding can be a difficult decision but with some planning it can be a fun and amazing bonding experience. The challenge often comes from balancing your theme (rustic / vintage / glam / boho / etc), colour choices, and vision with the body types of your ladies, their skin tones, and their personal style. While you want to ensure that the ladies you have asked to stand with you feel beautiful and confident you also need to hold on to your vision - it is your day! Once you have decided what configuration you want for your big day you can let your ladies know what their options will be and if they will be choosing different styles, colours, or the same dress. If your tribe knows what to expect when you go shopping then the day will go much smoother, you can address any of their concerns or questions before you get to your appointment and you can have a fabulous day together with no dress drama. Bridesmaids dresses can take 3 to 6 months to come in, start talking about schedules and timelines as soon as you can so you have plenty of time for shopping and any alterations needed after they arrive. We also recommend chatting with your tribe about budget and determining if the ladies will be paying for their own dresses, if it will be a shared expense, or a gift. Knowing what price point you want to be in and what your ladies can afford will help your stylist choose dresses that respect everyone's unique financial needs. At the start of your appointment let your stylist know what your ideal look is, if you have anything pinned or saved on Instagram share it with her so she can help you bring that vision to a reality while staying on budget. Have a few notes of any other important details that she may need to know including if any of the ladies will be (or may be) expecting at the wedding, any modesty or faith restrictions for any of the ladies, and if any of the dresses will need to be shipped any where. It is our honour and privilege to be part of your wedding and to help your ladies find the perfect dresses to ensure that when they are standing beside you that you all feel beautiful and create a picture that captures your special bond for a lifetime.